Audi PB18 e-tron - R18 LMP1-inspired electric sports car concept makes Pebble Beach debut, future R8? Home » Cars » Audi PB18 e-tron – R18 LMP1-inspired electric sports car concept makes Pebble Beach debut, future R8? Audi PB18 e-tron – R18 LMP1-inspired electric sports car concept makes Pebble Beach debut, future R8? Audi has revealed the PB18 e-tron, a design and technical concept car, at the Pebble Beach Automotive Week in California. Created in Audi’s new Malibu design studio, the all-electric PB18 e-tron is described as a radical vision for the high-performance sports car of tomorrow. The abbreviated name refers both to the Pebble Beach venue for the premiere and the technological DNA it shares with the successful Audi R18 e-tron LMP1 racing car. At first sight, the PB18 e-tron shows its kinship with the Audi Aicon concept from Frankfurt 2017. This holds true not only for characteristic design elements like the side windows that angle inwards and the extremely extended wheel arches – the two concept cars also share their electric drive with solid-state battery as energy storage. But while the Aicon was designed as a fully automated, long-distance luxury car, the PB18 was designed as a driving machine for the road and track. Audi talks up dynamics and emotion, and a “completely new dimension” of driver-orientation. Here’s some good news for those worried about the act of driving going extinct. 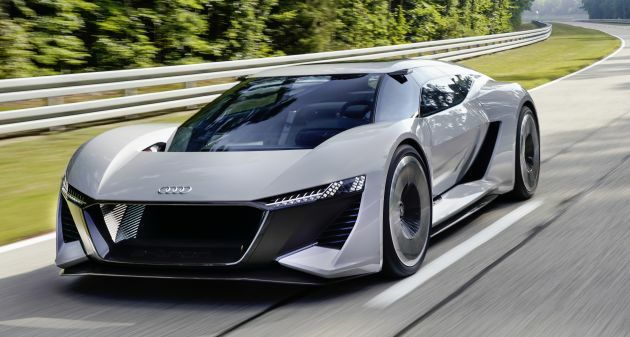 The internal working title at Audi for the showcar project was “Level Zero”, an explicit way to differentiate it from the Levels 3, 4 and 5 of autonomous driving currently in focus at Audi. In the PB18, the human is the one steering, accelerating and braking – there are no complex systems and no comfort features to add weight. What’s there is a driver’s seat and cockpit that are integrated into an inner monocoque shell that can be slid laterally. When driven solo, the monocoque can be positioned in the center of the interior, single-seater race car style. This is made possible by the by-wire design of the steering and pedals, as opposed to mechanical connections. “We want to offer the driver an experience that is otherwise available only in a racing car like the Audi R18. That’s why we developed the interior around the ideal driver’s position in the center. Nevertheless, our aim was to also give the PB18 e-tron a high degree of everyday usability, not just for the driver, but also for a potential passenger,” said Gael Buzyn head of the Audi Design Loft in Malibu. When the cockpit is slid into the side position, the PB18 can be steered like a normal road car, and there’s room for a passenger seat, integrated low above the ground and equipped with a three-point seatbelt. The driver also benefits when getting in and out from the easily accessible outside position of the monocoque, which can be moved when the door is open up to the sill. The PB18 e-tron package follows the traditional architecture of a mid-engine sports car with a cab that is pushed far forward. The car’s center of gravity is located behind the seats and in front of the rear axle – which benefits driving dynamics. A mix of aluminum, carbon and multi-material composites ensures low weight of below 1,550 kg. The PB18 e-tron is 4.53 metres long, 2m wide and just 1.15 metres tall, with a wheelbase of 2.7 metres. Those are sports car dimensions, and when viewed from the side, the eye is drawn to the gently sloping roof line which is pulled far to the back and features massive C-pillars. Together with the large and almost vertical rear window, this design is reminiscent of a shooting brake. The distinctive silhouette accommodates 470 litres of cargo space. The rear diffuser air outlet has been raised high – another functional feature borrowed from motorsport. The diffuser can be moved downward mechanically to increase downforce. The rear spoiler, which normally is fixed, can be extended rearward for the same purpose. The 22-inch turbine wheels, together with the air inlets and outlets of the wheel arches, ensure air supply to the 19-inch carbon brake discs. The laser high-beam headlights with its big range made its debut in the Le Mans R18 car, where the maximum light output at speeds above 300 km/h offered a crucial safety advantage at night. The hood dips deeply and acts as a lateral bridge running across the nose, connecting the two accentuated fenders and also doubling as an air deflector – this design is familiar from racing prototypes and offers the driver great visibility. The concept uses three electric motors – one up front and two in the rear. The latter are centrally located between the steering knuckles, each directly driving one wheel via half-shafts. They deliver up to 150 kW to the front axle and 350 kW to the rear. Maximum output is 500 kW, but with boosting, the driver can temporarily summon up to 570 kW. Combined torque of up to 830 Nm allows acceleration from 0 to 100 km/h in barely more than two seconds. The liquid-cooled solid-state battery has energy capacity of 95 kWh. A full charge delivers over 500 km of range in the WLTP cycle. Already designed for 800 volts charging, the PB18 can be fully recharged in about 15 minutes. It also supports cordless induction charging. In daily driving, the driver can limit maximum speed in favour of range. While on the move, the PB18 recovers energy: up to moderate braking, the electric motors are solely responsible for decelerating the car, and the hydraulic brakes only come into play for heavy braking. The Torque Control Manager, which works together with ESC, actively distributes power to the axles as needed. Thanks to the instantaneous response of electric motors, the control actions are said to be lightning-quick. The front and rear have independent suspension on lower and upper transverse control arms, and, as commonly found in motorsports, a push-rod system on the front axle and pull-rod system on the rear. They work in conjunction with adaptive magnetic ride shock absorbers. Just a flight of fancy? The Audi e-tron quattro concept from Frankfurt 2015 has seen the production light, and will debut next month. The electric SUV offers more than 400 km of range in the WLTP cycle with the spaciousness and comfort of a typical full-size car from Audi, its maker says. In that light, the PB18 e-tron could well be an R8 of the future. Will be unveiled in Pebble Beach on August 23, 2018 – the Audi PB 18 e-tron show car. Best looking electric concept car in years…..
infiniti and mb’s efforts pales in comparison to this….